The rail station is a convenient and stimulating change agent for the Allston/Brighton community. “It is exciting to be part of a revitalization project such as this,” said Sanborn Head Vice President of Business Development & Marketing Kim Sousa. 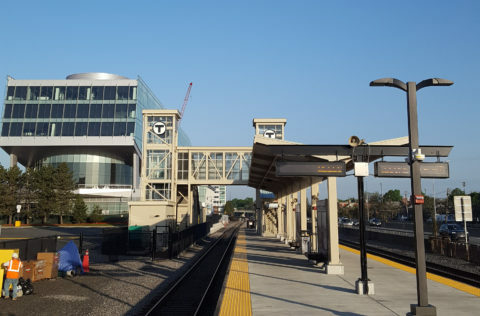 “It offers a new way to travel to Boston and has been uniquely funded through a public-private partnership, with the MBTA and New Balance/Jim Davis. 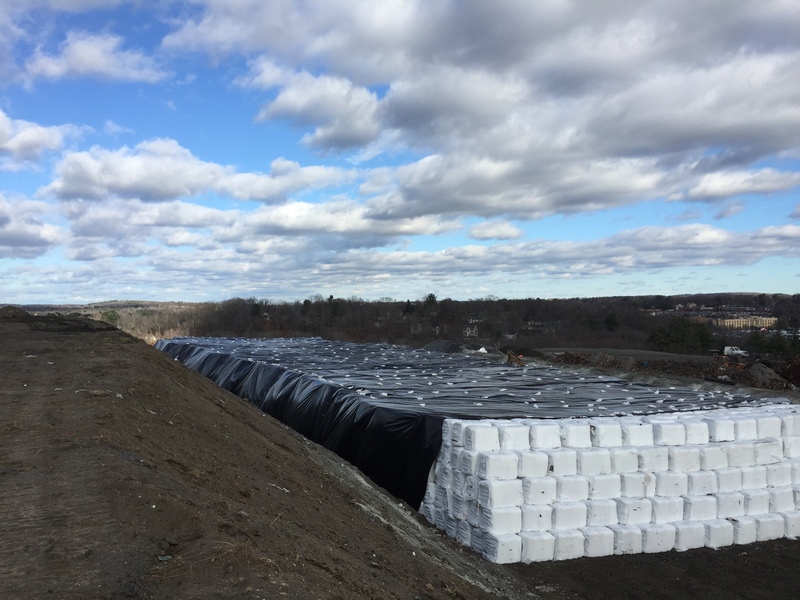 It’s a partnership that greatly contributed to the success of the project.” Trains arrived at the Boston Landing station for the first time on May 22. Boston Landing is a mixed-use development in Boston’s Brighton neighborhood, which encompasses approximately 14 acres of land along the Massachusetts Turnpike. The site was once the largest stockyard in the area. It now consists of class A, LEED-certified office space within New Balance’s new world-headquarters building, lab and office space, retail stores and restaurants, the Warrior Ice Arena (home of the Boston Bruins practice facility), the future home of the Boston Celtics practice facility, as well as a future residential building located at 125 Guest Street. Sanborn Head is an engineering and technical consulting firm serving a broad array of private, public and institutional clients in the development, energy, industrial, and solid waste markets. Our multi-disciplinary team of engineers and scientists specializes in integrating our core expertise in earth, energy, and environment to deliver innovative, yet practical solutions to our clients. May 26, 2017 – Boston, MA – The Environmental Business Council of New England (EBC) is pleased to announce that the Block Island Wind project is the recipient of the 2017 EBC Ira W. Leighton, Jr. Outstanding Environmental – Energy Technology Achievement Award. 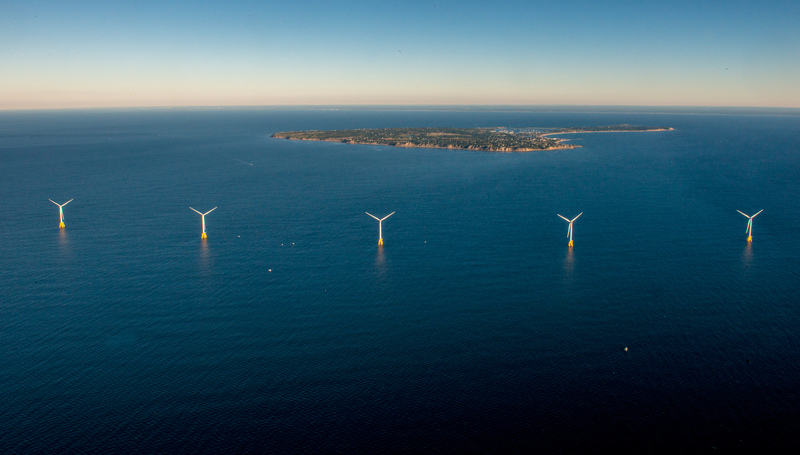 The 5-turbine Block Island Wind Farm, located roughly three miles off the coast of Block Island, R.I., is America’s first offshore wind farm and has jumpstarted the U.S. offshore wind industry. The wind farm began operations in December 2016 and, at 30 megawatts, produces enough energy to power roughly 17,000 Rhode Island homes. This award, established by resolution of the Board of Directors on January 15, 2014, recognizes the significant contribution made by Ira Leighton and will be awarded, annually, to an organization or individual(s) for developing or applying innovative technologies to solve problems or advance the state of the art in the environmental – energy sector. This award will go to “difference makers” because Ira was a difference maker. Ira Leighton (1945 – 2013) was among the first employees hired at the EPA Boston office in 1972 when the agency was in its infancy. He then went on to meritoriously serve New England and the nation, at EPA, for the next 41 years. As a career civil servant and senior EPA leader, working out of the Region One office in Boston, he made positive impacts on the lives of countless New Englanders and citizens across the United States. His vision helped shape EPA’s reliance on sound science and legal integrity into effective policies to protect the health of all Americans from pollution in the air, water and land. 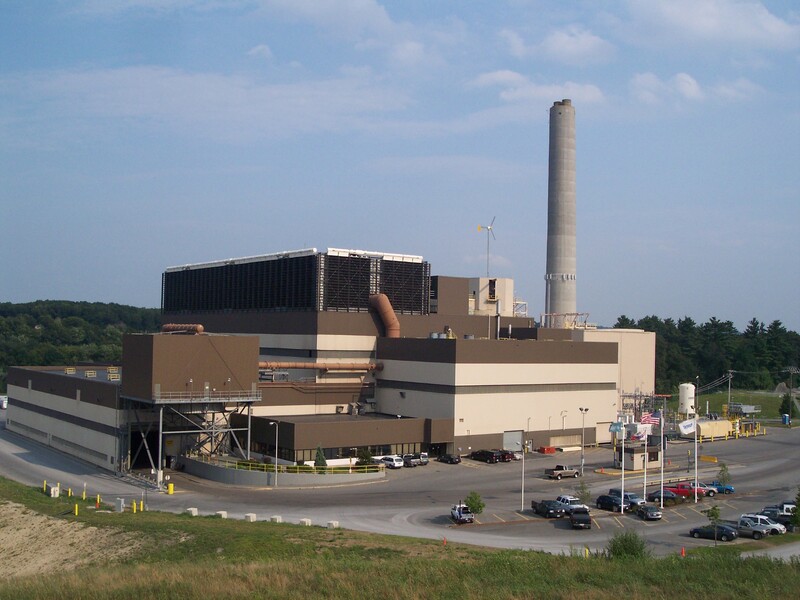 Ira started working for the U.S. EPA’s Boston office as an engineer, after working at the state and municipal levels. During the 1970’s and 80’s, he worked on solid waste management issues and then on contaminated site clean ups. He was pivotal in shaping EPA’s Superfund program in New England following the 1980 passage of the Superfund law. In the 1990’s, Ira managed EPA Region One’s enforcement efforts. He fostered an integrated approach, providing assisting regulated entities in understanding environmental obligations and then followed with measured enforcement actions against those that did not comply. For his last 13 years at EPA he served as the Deputy Regional Administrator – the senior career official – in EPA’s Region One office, overseeing the Agency’s panoply of programs throughout New England. The Block Island Wind project will be honored at the Annual EBEE Awards Celebration on June 8 at the Marriott Copley Place Hotel in Boston, Massachusetts. The available presentation from the EBC Evening Program with Colonel Barron, New England District Commander, U.S. Army Corps of Engineers completed on May 24, 2017, can be viewed below. Presentations are not available for download. 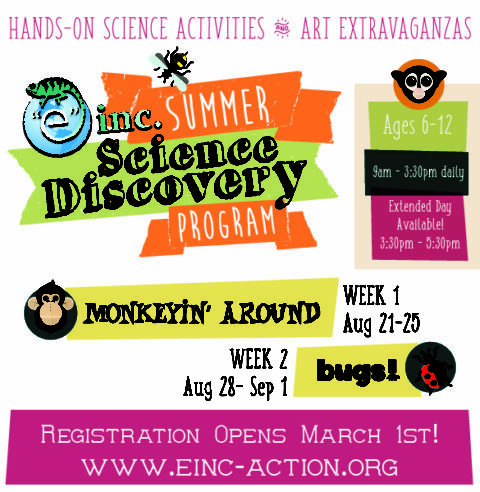 “e” inc.’s Summer Science Discovery Program is Back! How many ways can a monkey use its tail? What do you call a group of gorillas? Join “e” inc. as we swing into the wonderful world of primates! Discover all the different types of primates, where they live and how much they have in common with us, humans! Week 2 (Aug 28-Sep 1): Luv Bugs! Of all the different animal species living on Earth, 80% of them are insects. Explore the world from a bug’s view and learn about how and where bugs live, some of the world’s weirdest insects, and what the world would be like if we didn’t have any bugs!